(UPDATE JAN 2015): We made it the whole way this year! Unlike last year, when the train north broke down in Wilmington and forced everyone into a mad scramble across the platform to another train, this year the ‘Meteor’ didn’t break down and we made it home on time. Nice to see the improvement! As yet unimproved are the weird in-room toilets in the roomettes, but maybe someday. 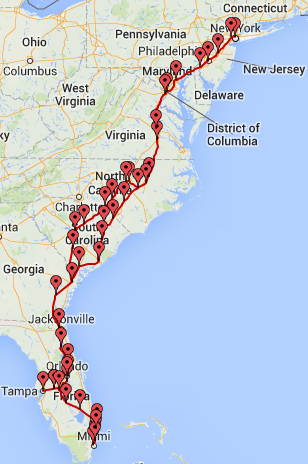 After twice closing out a Florida vacation on the Auto Train, this year it was Amtrak’s Silver Meteor, running between Miami and New York City (Penn Station). It won’t carry your car, but the slow moving ‘Meteor’ (aptly named only in comparison to a horse and buggy) goes beyond D.C. in the north and Orlando in the south, making for a more convenient trip for anyone not local to those two stations. Like most long distance Amtrak trains, a variety of tickets are available, from seats at one end of the train, to roomettes (max two people) and rooms (max six) at the other end. At the center of the train are a lounge car, with drinks, snacks, and light meals, and a dining car with full meal service. Reservations are required for the dining car, but not in the lounge car, where lines can get quite long during meal times. Meals in the dining car are included for those staying in rooms, extra for those in the seats. 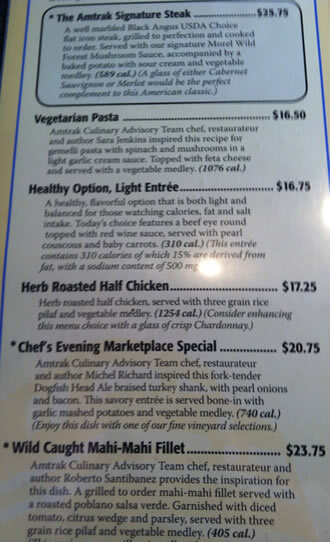 Either way, don’t expect the food to be cheap just because you’re on a train instead of a plane – check out the dining car prices in the photo. The food is quite good, far better than that offered by the airlines, with a much wider selection. One thing to keep in mind, especially for those traveling alone or as a couple, is that dining car seating is four to a table – meaning you’re breaking bread and talking with others. In a bad mood? Don’t feel like talking to strangers? Then you’re unlikely to enjoy this part of the experience. A saving grace is that train crowds are normally eclectic and willing to talk, where else can you have dinner with a TV producer from Vancouver and an Italian tour guide who visits North Korea every summer? Or a retired train buff and his wife, spinning off well-practiced tales of 50 years working and riding the rails? Another alternative is to bring your own food. Combine a private room with a bottle of wine and the trip quickly turns romantic. However, a big drawback to the romance is the toilet located smack in each room, only hidden behind a partition in the larger rooms. According to the conductor, Amtrak is planning to update these cars and get rid of the toilets in the roomettes (as on the Auto Train and City of New Orleans), but the timeline for this is unclear. For those traveling in a roomette, prepare to step out of the room or get to know your travel companion in a whole new way. The ride itself, which we did from south to north, was mostly pleasant. 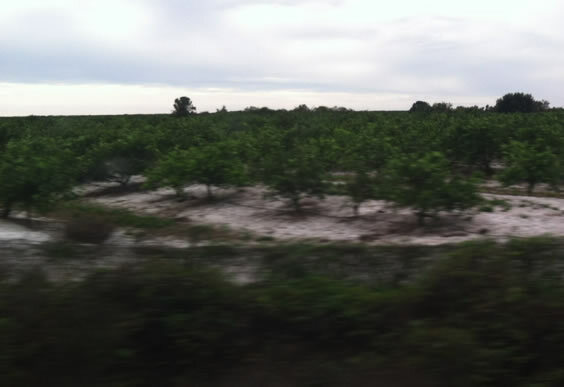 Beach Florida transitions to cowboy Florida north and west of West Palm, with citrus groves and Christmas tree farms interspersed with rundown train stations. Heading north, the warmth of the southern beaches gradually fades and people in passing towns slowly start to appear in warmer clothes and, depressingly, the occasional jacket. Orlando brings a major change; with formerly empty seats and quiet rooms suddenly occupied with families heading home from Disney. By Jacksonville, with the sun setting and the train full, most people seem to have settled in for the long haul. The lounge car is a scenic, rolling bar and the dining car is open for business. Schedule-wise, we were running behind, but everyone assured us we’d make up the time (we did) overnight in North Carolina and Virginia. 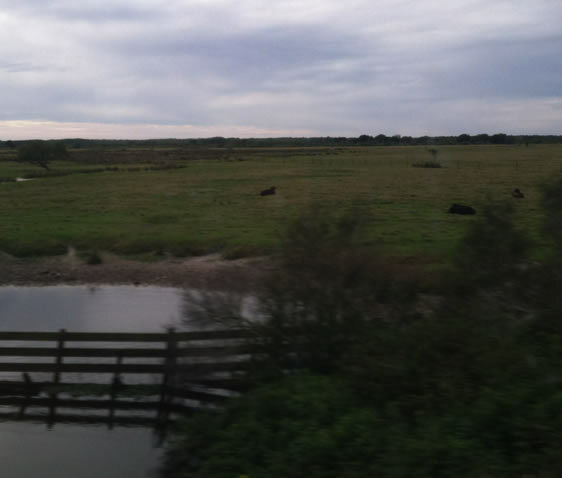 By Charleston it was noticeably quieter, with the scenery outside limited to brief flashes of light against a long dark background. Inside it was similar, with many huddling around screens to watch whatever they’d downloaded prior to boarding, or to complain about the slow download speeds if they hadn’t prepared – middle of nowhere SC is not where you want to try and download a movie on a train crowded with others attempting the same. 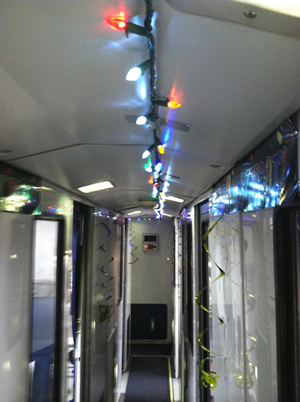 If you’re traveling over the holidays, the attendants will likely add a festive touch by decorating their cars. Keep in mind they largely do this out of their own pocket – tips are always appreciated. For most people heading north, you’ll likely fall asleep somewhere in SC and wake up during the stop in DC, where few things are more pleasant than looking out from your bed as dawn breaks over a crowded, cold Union Station. 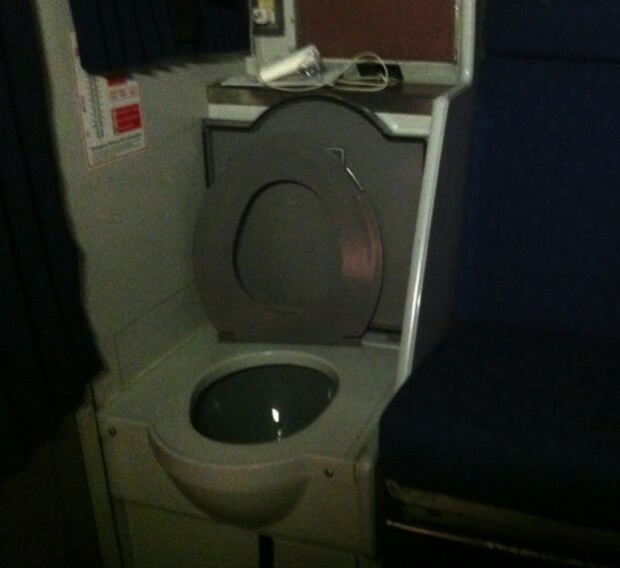 After that it’s back down to the dining car for breakfast (again, included if you bought a room, extra if you’re in the seats), maybe a stop in the shower stall to freshen up, then a brief couple of hours until you’re home. Our Silver Meteor broke down in Delaware, forcing a harried, luggage-laden evacuation from a warm bedroom across a cold platform and onto a normal Northeast Regional train. The new train was hardly prepared for onloading everyone from the Silver Meteor, resulting in a dual load of grumpy passengers, overflowing luggage, and a late arrival. Of course, you can hardly transfer mid-flight if your plane breaks down, and the attendants were beyond helpful in getting everyone across the platform and onto the new train. Still, the mad dash across the cold Delaware siding was a huge buzzkill, up until then the trip had been a relaxing transition from a warm Florida Christmas break to a cold, work-filled northeast new year. Heres hoping your trip ends more smoothly.